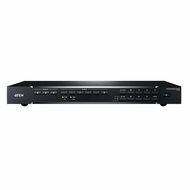 VP2730 is a multi-in-one presentation switch that integrates video matrix switch with scaler, streaming, audio mixer, HDBaseT extender, and analog-to-digital converter functions into one compact device. With seven multi-format inputs to two HDMI and one HDBaseT high-definition outputs, VP2730 empowers larger meetings and facilitates collaboration between local and remote participants in boardrooms, video conferencing rooms, lecture halls or distance learning classrooms. With the user in mind, VP2730 comes with a straightforward and accessible OSD and Web GUI to streamline operation for both local and remote participants. To facilitate sharing and collaboration with no distance limitations, VP2730 not only allows the meeting moderator to share video content to up to five remote sites, but also enables remote sites or local participants to wirelessly stream in their content for discussion. The moderator can monitor and switch among sources in any variation of full-screen, dual-view, tri-view, quad-view or PIP modes, with up to six sources displayed simultaneously on one screen. VP2730 also features more advanced meeting management functions: Moderator Mode enables the meeting moderator to control other displays via the host display: Chat Room facilitates meeting communications: while Screen Capture and Freeze record and control the meeting flow. This Collaborative presentation solution facilitates distance-free content sharing along with advanced audio, simplifying AV integration via eliminating the need for numerous individual components and the compatibility challenges that accompany them.